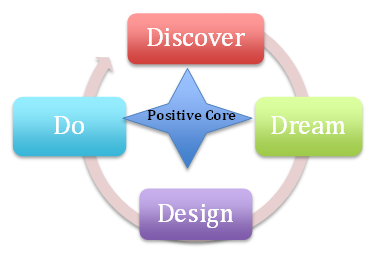 Here is a 5 step, interactive process that pivots around the positive core. Discover – from the platform of your positive core put on your explorer’s hat and then take risks, ask important questions, follow your heart – don’t fear getting lost, there is no failure. Dream – based on your explorations and discoveries envision the possibilities that could be built upon the platform of your positive core – imagine what could be. Design – plan what will be. Do – the only way to know the future is to create it – this is the step where you create what will be. When it fails, congratulate yourself for getting this far, and then go back to step 1 and do it again.